I was extremely overwhelmed after reading the above mentioned article in TOI. This is because the author of the article seemed to be deeply concerned about the future of research in JNU, something which is otherwise extremely devalued in our country. Consequently he sounded very perturbed about the ‘lengthy slogans’ and ‘lousy standard’ of research in JNU. At the first blush he appears to be an emphatic (right)er but a closer examination of his piece reveals that what he did in fact was to embellish himself with a robe that is far too hollow and invites a rebuttal. 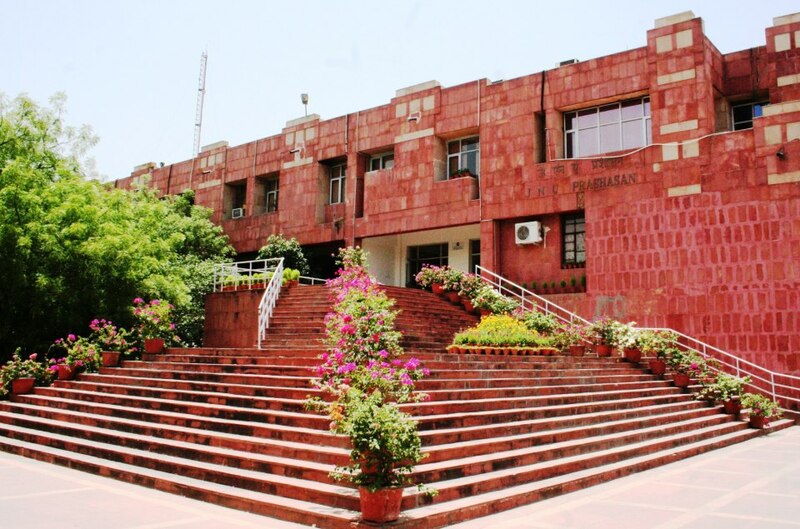 Subsequently if one was to judge the quality of research in JNU by taking this article in TOI as a standard, certainly then one has to admit that the standard of research in JNU has become lousy because of the various statistical and logical fallacies, analytical errors and contradictory claims in the piece. In this, it is amply clear that the author is batting with a “right” hand stance and selective memory is at work, concealing important facts. As we know that if numbers are totured enough, they will speak what you want them to”. Let me put things in perspective. The author says “Last week – Monday and Tuesday – witnessed yet another strike in JNU”. Here the article is partially correct in pointing out that on 27th March, 2017 (Monday) there was a strike, but it does not state that it was the fifth day of the Students Union strike that began on 23rdMarch, 2017 (Thursday) and continued till 28th March, 2017 (Tuesday).More importantly the strike was completely observed by the all the students of CSLG (the centre that the author cites as an example of lack of support for the strike) on all the days with no classes taking place on any of the days (except for that one class that the author mentioned; to the details of which I shall come in a moment) while the students turned up to the centre daily in solidarity and tried to find out the adverse ramifications of the regulation. Even on 28th March, 2017 (Tuesday) as correctly pointed out in the article there was strike. But what is conveniently omitted is the fact that on the same day, the JNUSU had issued a call for a protest outside UGC office in which significant number of students of the very same centre participated (along with several hundred others from various centres). To the best of my knowledge all these students of CSLG are what the author calls “independent students who reject political-party based campus dialogue”. Yet they participated in not only this protest but also in the earlier once organized against the UGC 2016 notification and has stood with JNUSU’s call on this issue every time. This punctures the author’s claim that the students unequivocally reject the Union’s strike. Now let me elaborate the details of the class (which I was also part of) that the author had mentioned. It is an elective course offered in Mphil 2nd semester at that centre, which is credited by 12 students and the author audits this course. 4 students were not present that day. So effectively 8 out of 12 crediting the course attended the class. So even statistically the claim is not correct that more than 80% of the people were present.Apart from that it is evident now that in quoting that more than 80% of the students attended the class an attempt was made to unduly exaggerate the statistics when absolute numbers were small. The author also seems to have forgotten the reason for which this class took place despite the apprehension of a few students who were still in favour of strictly following the students union call. This was because not all the students who credited the course were present in the centre to show their solidarity. The pre-decided norm “boycott the classes but be present at the centre” was not held up that day for that class due to absences and hence the class took place. There are other gaffes too. To quote from the piece “Of the more than 8,500 students in the residential university, only 4,865 students had stepped out and cast their votes in the last student election. Among them, 1,077 voted NOTA. So JNUSU’s theatrics is not representative of the contemplative silence of several students”. Of course, the author has not published his article in a “peer reviewed book or journal” which according to him is “the only standard of research”. But that does not give him the liberty to tinker with the data the way he wants. As per the figures published by the Election Committee and as also pointed by others who have responded to the author’s false claims,the number of students who stepped out and cast their vote in the last student union election in 2016 were 5,138, and not 4,865. Further the highest number of votes polled for NOTA was 437 (for the post of Vice –President) which is less than half the figure of 1077 that author had quoted. The count of NOTA votes for the other office- bearer posts stood as: President – 135, General Secretary- 296, Joint Secretary – 272. I don’t know how the author has arrived at the figure of 1077. In case a simple summation of NOTA votes cast in all office bearer positions was attempted, then this is yet another statistical and analytical blunder not to mention the arithmetic error. Why does the author cite (wrong) absolute numbers here and percentages earlier. Of course the criterion in both the cases was to support the argument with an exaggerated statistics, when the argument itself is unavailing. 5138 out of 8500 is 60.44%. Now this is roughly equivalent of the turnout on the basis of which mostly the representatives are being elected at state and centre level in our esteemed democracy and the governments are being formed in the country. So why is one sceptical of the same number as not being representative enough for choosing the students union body. No form of governance system is free from some biases. But if one is making the claim about under-representation, one needs to look at the problems of the first past the post system. Then one should also consider the extent of under representation at the national level on the basis of which governments are formed in the centre with less than 35% of the people voting for them. But I suppose one cannot run the risk of annoying one’s political masters. The state is making enough attempts at surveillance through CCTV and Aadhar. I am amazed that the author is adept at myriad forms of surveillance over the students in JNU e.g. like peeping in the library, reading rooms and hostels to be able to assert in TOI that “But the call for inactivity by the JNU Students’ Union (JNUSU) was hardly under observation in libraries and hostels. Reading rooms were full during daytime and so were those hostel beds whose occupants are wise owls of the night.” Even if some of the students were studying in the libraries and hostels, how is that proof of their disjunction with struggle call of the students union? It is also important here to mention that there are not always lengthy slogans being raised as the title of the author’s article suggests. In fact there is a short and crisp slogan which is “STUDY and STRUGGLE”. The author also needs to be reminded of the fact that some former Student Union representatives who had once raised “lengthy”slogans in their students days also did “serious research” alongside and are today hold faculty positions in JNU. They have many publications in peer-reviewed books and journals (the paucity of accumulated data prevents me from putting exact numbers) which according to the author is “the only indication of excellence in research” and rightly so because their publications reflect deep flair of “serious research”. It also serves as a means (sadly though) to satisfy the mechanical“API requirements” which UGC has made mandatoryfor appointment and promotion. While most of the faculty have raised their concerns either in writing or verbally about API not being an effective measure of academic performance and research but the author who is a ‘messiah’ of “serious research” and takes umbrage to “lousy Research” did not utter a word on that. Also publications in peer reviewed journals, impact factors and the quest for world rankings while important, but these being considered “the only indication of excellence in research” reflect a particular colonized mindset (which seeks approval of the West) which the author is not able to jettison away. This might annoy his friends who are increasingly pointing at ‘unique Indian culture’ and attacking the “Western Intellectuals” for not respecting it. An important issue was raised in the article regarding the low level of number of submitted to published thesis in JNU. Either the author lives in an utopian world or at complete dissociation from reality of the commercial publishing industry. Increasingly more than “serious research” it is the market value of a topic in terms of “what can be sold” and how much royalty it shall generate that decides the fate of publication. Further the gestation period in terms of the thesis submitted to being published in academics is becoming an increasing function of one’s appointment as a permanent faculty in some university or as a head of any government/autonomous research institution, ministry or think tank without which mostly the renowned publishers won’t publish your research. The very “lousy research” of which the author is very apprehensive will happen as we have forgotten that universities stands for debate, dissent, academic rigour and most importantly“serious research” which may or may not be mutual to the idea of a promising career with ‘good packages’. The government anyway is more concerned about the “promising careers” of the youth and hence escalating investment in technical universities and management institutions. I suppose that will better take care of the career concerns highlighted by the author. Further if one is seriously concerned with the careers of students in masters programmes at JNU, then one must also be aware of the changing dynamics of one of the “promising career” which is University teaching, where a doctoral degree has almost by norm became an entry level requirement these days and it is the access to this very doctoral degree which is being restricted for many by this UGC regulation of 2016 which the author upholds. I am glad that the author raises the point regarding resources. He says “It is surprising that the issue of quality research is never raised in JNU. It does not have a publication division, it does not host a journal, the central library is not fully functional as it is under renovation for many months now and departmental libraries lack space and staff. Yet none of these issues ever provoke a chorus on campus”. ButaAgain I think the author has not done sufficient homework. Otherwise he would have found that since more than a year, when the issue of cut on non-NET fellowships was being raised and the occupy UGC movement took place there have been continuing protests by those raising “lengthy slogans” for increasing the library resources and for other concerns regarding research and publication like the issues of falling number of subscriptions of journals, magazines and databases by JNU library, a point which author did not even bother to mention. There are people who are “struggling” day in, day out to make sure that the resources for research are not curtailed and level of research escalates in the campus. Most importantly they do not resort to the refuge of “print media” for acknowledgment or appreciation of their efforts. It is quite clear that in making his arguments regarding infrastructure for research the author is barking up the wrong tree and that too deliberately. This is evident from the fact that at no point does the author states the obvious - it is not in hands of students to raise the infrastructure required for research but for the government to provide through adequate funds in public universities. But at the same time there is an acknowledgment about of lack of investment in education when the author says “Interestingly, those who wrongly call research a right never highlight the lack of investment in school education which is a legal right”. So till once get higher education as a legal right, there should be no investment in higher education? The reason library and other resources are in shambles in most universities is because there is a continuous cut in the expenditure on education from past three years. It has been reduced to less than half a percent of GDP in 2017-18 by the present government. I maybe accused of lousy research here because I am citing a newspaper report. This is because on the MHRD website one would discover that the trick is to not provide the data on education expenditure post 2013 (when it was already at abysmally low levels of less than 5% of GDP). This is synonymous with the income tax data concealment that has been done for a long time and which when revealed made their claim of JNU students being parasitic on tax payer’s money completely hollow as only 1% of the population pay direct taxes. It would have been much better if author had voiced his opinion on these issues as well. Again the self contradiction of the arguments resurfaces because how the best from all sections in the society will gain admission into the university with the UGC regulation in place on one hand ensuring drastic seat cuts and on the other hand to do away with affirmative action and deprivation points? I guess it would have been much better if those viewing the UGC regulation to be progressive have thought about sitting on the other side of the fence for a moment and hypnotize being born in an opposite gender of to a not affluent religious minority hailing from rural outskirts denied of all the opportunities to gain quality primary or secondary education leave aside thinking about making it to higher education? Perhaps then one would have understood the plight of those who fall in the ambit of affirmative action but never enjoy being part of it. Perhaps then the author would not have lamented the futility of affirmative action and deprivation points at higher education level. I fail to understand why theauthor wants to himself in this appear in guise of a progressive man by even doing the lip service of saying that students from all sections will gain admission because of the UGC 2016 notification. Who is it that he and his ideologues are afraid of? Is it the attack (from pen and not from stick as some may infer) from the “real progressive” people? I suggest they should not be worried as already the space for progressive voices is shrinking in the campuses. One should be courageous enough to fall in line with the counterparts in the state to implement exclusionary entry to research and that it should not make way for thousands. Why should research make way for thousands especially for those who are not endowed with the power of eloquent speech, why should research make way for those not endowed with the power to articulate in English effectively, why should research make way for those who are being pushed at the margins due to the presence of various biases, and why should research make way for those who are “historically discriminated” over those who are “intellectuals”? As a shrewd (Right)er, the author has provided a list of those who according to him are excluded from the category of what he calls “particular historical discrimination”. I request the learned author and his pseudo intellectual gang who are doing “serious research” to stop creating false binaries among those who are “historically discriminated” and “particular historical discrimination”. The binaries that are being tried to make with eloquent speech do not exist. This is because those historically discriminated is the group fighting against UGC regulation relentlessly and also have deliberately chosen not to affiliate with right wing students. And I think that is the reason the author and his ideologues are getting restless along with the fact that they have not succeeded in achieving political majority on this campus for a very long time. brings me to another logically fallacious statement that the author had made which was “with UGC regulation in place the seat distribution would not happen based on the political affiliations”. The data from the last student’s election bursts the balloon of the claim. The General Secretary candidate of the major right wing party on the campus got a little over half the votes polled by the Vice president candidate of the left wing organisation (1330 and 2461votes respectively). Even if I assume complete merit in the author’s claim that students are admitted on the basis of their political affiliations, then reducing the number would not change the status quo either which is that left leaning student’s hold majority in the campus. All that the author is doing in making such claim is questioning the credibility of JNU authorities in conducting a free and fair exam as a result of which ideological people enter into the campus. But I again advise the author not to resort to such claims, otherwise he will be devoid of the fruits he wants to reap from all his political Guru Bhais. The author should just throw away the cloak of being the sympathiser of those “historically discriminated” as it may well be choking. It seems from his views on deprivation points and affirmative action that one should indeed believe in what Ayelet Shachar calls “birth right lottery” and keep on encashing that by allowing only those who won the lottery (by virtue of being born in affluent families) to be a part of the research cohort. After all “great academicians are born and not made” is what the author’s article in TOI is hinting at. More familiarly, even greatest of thinkers. Social Darwinists will support the author’s claim in upholding and ensuring only the fittest shall survive along with the advocates of the free market. Research then should be a virtue of a handful of people and especially those who are inside the campuses with rest being jettisoned of it because who cares for future generations! Finally, the author that he cannot have his cake and eat it too! If one is so apprehensive about the standard of research in JNU, then the free market provides you enough choice to pursue a degree elsewhere. Why be in an university that is so “lousy” in research! People like the author are in fact the ones who want the best of all the worlds - of mechanical things like NIRF rankings, NAAC grading etc that the University receives to hone the value of their degrees in “market” and at the same time do flip flops to support the dominant narrative to find space in a newspaper column when the same university is being attacked for its dissenting voices which are fighting for campus to be a more inclusive and democratic space.